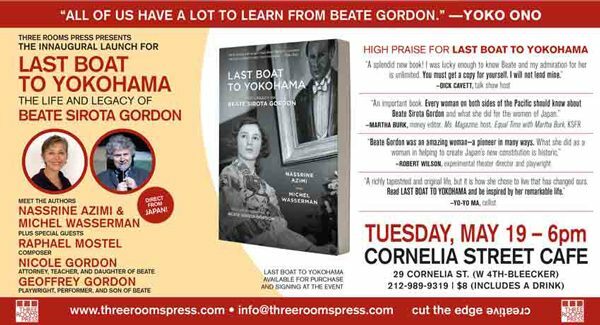 Three Rooms Press cordially invites you to attend the inaugural launch of the extraordinary biography LAST BOAT TO YOKOHAMA: THE LIFE AND LEGACY OF BEATE SIROTA GORDON, Tuesday, May 19, 6 pm, at Cornelia Street Cafe. The event will feature readings by authors Nassrine Azimi and Michel Wasserman, a special presentation by composer/musician and Beate associate Raphael Mostel, and readings by Nicole Gordon (attorney, teacher and Beate’s daughter) and Geoffrey Paul Gordon (playwright, actor and Beate’s son). Admission is $8, which includes a free beverage. Books will be available at the event for signing and purchase. In 1946, a remarkable woman secretly helped create Japan’s new constitution, writing an article that mandated equal rights for all women in Japan. Few could imagine that Article 24 was the work of a 22-year-old Vienna-born, naturalized American woman of Ukrainian-Jewish descent who had grown up in Japan. Her name was Beate Sirota, and to this day she remains an idol for generations of Japanese women. This extraordinary biography includes a foreword by Beate, an in-depth look at her father, the world-renowned classical pianist Leo Sirota, personal diaries from the World War II era by her mother, Augustine, as well as a detailed overview of Beate’s life, including the ongoing impact of her contributions to the Japanese constitution, as well as her personal impact on world ­culture fostered by four decades of dedication to introducing authentic dance, theater, and music of the Far East to American audiences. “Anything about the remarkable Beate Gordon is interesting. And that’s too mild an adjective.